OpenOffice.org 3.0 (UPDATED) DEV300_m7 BEA300_m1 is out. The title bar reads "beta." 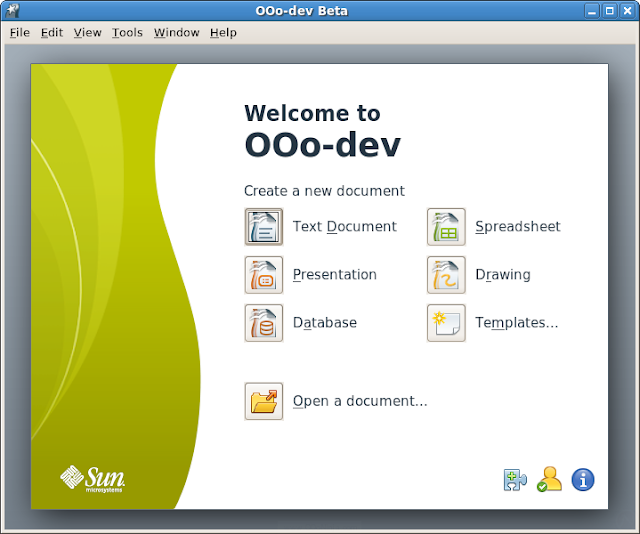 The about dialog reads OpenOffice.org 3.0 "beta" twice. It looks like a beta. It smells and tastes like a beta, but is this really OpenOffice.org 3.0 beta? No. It's a development snapshot which is like an alpha version. 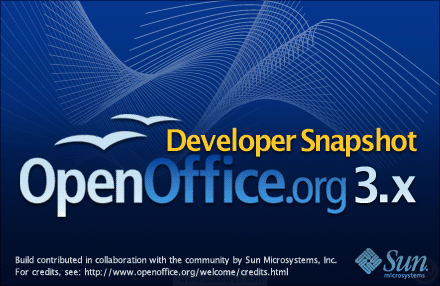 The real OpenOffice.org 3.0 beta is due April 30. You are welcome and encouraged to test any version to find and report bugs and to discover new features. The stable OpenOffice.org 3.0 release is still due September 2008. DEV300_m9 adds a desktop start link on Windows. How do I tell which milestone I have. I downloaded it the last time you wrote about it. I've been using it for work and have encountered no serious problems. BTW where is the best location for extensions? A Wandering Cleric: Two ways to tell. 2. Hold CTRL while pressing (in order) S-D-T. This is sort of an Easter Egg with the build number plus developers' names. Check the file name you downloaded. And what about Formula Editor? Is there any improvements? 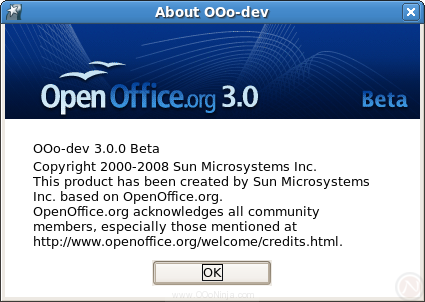 I just installed OOo 3.0 Beta. When I first pulled it up, I could tell immediately that it had more polish. It looks sharp. I changed my icon set to the Galaxy icons and I couldn't be happier. I use mostly the spreadsheet and writer and I'm looking to wrap my hands around Impress a bit more. Yesterday, I download and install 3 beat. but, i face serious problem I cant save it in any format. it doesnt work and continuously show error. Could you anyone tell me what the problems are? Thanks in advance. you can send the solution to ahhpual@gmail.com. How would I install those eye candy opengl transitions in impress 3.0 beta2? I'm using Ubuntu Hardy at this moment. Anonymous: Read the article "Where is the OpenGL 3D extension for Impress?" There is not an OpenOffice.org 3.0 beta 2 OpenGL download that I am aware of, but maybe it is in the experimental Ubuntu repositories. i'm trying to do a paper in MLA format and i'm trying to get the title centered only and the actual essay to be aligned left. but when i highlight the title only and click center, the whole essay goes center. why is this happening!? This is in response to a request for help that was sent on March 9, 2009. I just had the same problem with the entire essay centering when I only wanted the title centered. I found this link extremely helpful and I'm placing it here in case someone else have the same problem months down the road like me: http://rexrose.com/DMAC/format.openoffice.pdf.